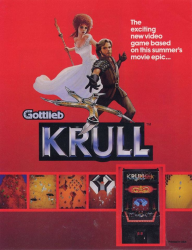 Travel to a distant galaxy, and to a planet called KRULL! Help Prince Colwyn battle the hideous Beast and his dark army of Slayers. Armed with the weapon of a king - the magical Glaive - you must survive the Slayers' neon spears, pass through the lair of the Widow of the Web, and fight the Beast in his own castle. Rescue Princess Lyssa, and the galaxy is yours!